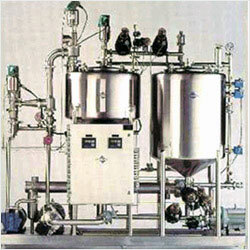 “CIP – Cleaning in place” is an essential part of maintaining hygiene in the process plants. In order to achieve optimum cleaning, parameters of the cleaning operation like concentration, temperature and flow rate of cleaning agent (water, acid / alkali solutions) have to be constantly monitored and maintained with previously defined set points. SM Biosystems' fixed and portable CIP systems have designed with these very objectives in mind and are skid- mounted for mobility, quick installation and easy integration into a large scale manufacturing facility or smaller operations such as a pilot plant or laboratory. These systems thoroughly clean process-equipment used in biopharmaceutical manufacturing including.